"It was chaos from beginning to end." Considering the rampant display of patriotism following the terrorist attacks on September 11th, I wonder if smaller DVD companies have scrambled to find war films that would have been otherwise forgotten. Perhaps that would explain the release of Mission to Death—a dull, simply written World War II movie that offers little material of value or interest. This story features bare-bones, laughable dialogue and situations that closely mirror numerous entries of the past. The story begins with the successful infiltration of a German radio base, which is guarded surprisingly lightly for a place of importance. The American patrol sneaks right up to the doorstep of this house and easily dispatches the security force. Following this job, they return to meet with another patrol who were attempting a similar mission. Unfortunately, this group never appears for the rendezvous, and the possibility exists of their defeat. Patriotic, confident Sergeant King (Jim Brewer) decides that it is their duty to make the trek and destroy the other radio base. This stirs conflict within the outfit, and some members strongly voice their objections to this task. Will this daring decision become a suicide mission for this patrol? Nevertheless, King continues to push his troops toward their ultimate destination. 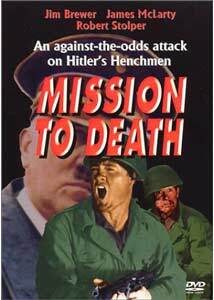 Mission to Death offers a successive collection of monotonous scenes that compare unfavorably to many war films preceding it. Much of the problems originate with the simplisitc dialogue that offers little in the realm of character development. In one unintended hilarious moment, the young rookie asks "Do you ever get scared?" to a military veteran in an unconvincing, innocent voice. The elder replies with a slight laugh, "Yeah kid, all the time, just like everybody else." This moment is completely awkward and lacks any emotional weight. It also signifies the imminent death of the experienced soldier, which will have the obvious effect on the young rookie. Another major problem exists with the ridiculous overdubbed dialogue that obviously does not match the voice of the actual soldier. In laughable fashion, these words often exist just slightly ahead or behind the movement of the speaker's lips on the screen. When soldiers utter silly lines like "Be careful, we may have company," the result lessens even further when his voice comes from another source. The lack of any depth in each character, even the stoic captain, is the central reason for the total failure of this story. The overdubbed dialogue is just one element in making it nearly impossible to closely follow their plight. During one conflict between the men, Sergeant King gives a speech that closely mirrors Tom Hanks' speech about his family in Saving Private Ryan 33 years later. In fact, the basic plot of this story bears a surprisingly resemblance to that film. However, the Steven Spielberg epic presents a realistic look at crossing the violent landscape of war. The setting of this film feels more like a journey through my neighbor's backyard. While its low budget obviously hinders the realism, that still does not excuse the creators from generating such an unconvincing product. Image Transfer Review: Mission to Death contains a full-frame transfer that ranks closer to mediocre VHS transfers. The picture has an indecent level of grain throughout the feature, and the images are hazy and unclear. While this may relate to the poor source material, it does not excuse this disc from the extremely low quality of this transfer. During the credits sequence, the words fall off the frame, which indicates a lack of effort on the distributor of this disc. Also, there are plenty of major defects that arise at various points of the feature. Audio Transfer Review: This disc includes a shallow mono track that conveys a muffled, simplistic sound presentation. While the dubbed conversations are understandable, the audio lacks any depth and is especially linear. Patriotic music blares often during this movie, and it comes through this track with very limited depth. While one can't expect too much from a mono track, this ranks as one of the worst transfers of its kind that I've heard. Winstar deserves criticism for presenting this feature with such a simplistic audio transfer. Extras Review: This disc includes trailers for five war pictures that cover a wide array of historical eras. All of these previews include full-frame, black & white transfers with low-quality pictures. There's also one for Mission of Death that offers barely adequate colors within the full-frame. This release also contains a link to the Winstar web site and DVD production credits. In trying to uncover more background on Mission to Death and director Kenneth W. Richardson, I searched the comprehensive Internet Movie Database, which usually includes something on every film. Neither this movie or its creator were even listed in this resource. This omission probably relates directly to the lack of interest in this production. Although it attempts to convey a patriotic message, the story gives only a few moments of interest within an uninspired viewing experience.